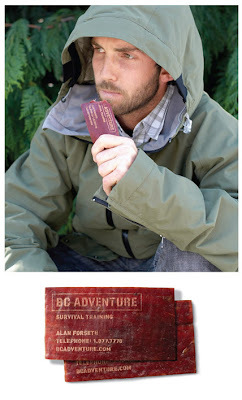 directdaily: BC Adventure Survival Training "Business Card"
The first rule of wilderness survival is preparation. That's why BC Adventure wanted to make sure everyone who stepped through their door left at least a little more prepared for the wild. Made from organic beef jerky this laser etched card is good to eat for up to a year in case you find yourself stuck in a precarious situation.